Excitement is building for the 28th Havana International Book Fair in Cuba, which kicks off 7 February through until 17 February, and will then move to the provinces until winding up on April 14, in the eastern city of Santiago de Cuba. Improbable as it may sound the Cuban book fair is not just the largest cultural event in the country, or even in the Caribbean, but is in fact the largest cultural event in Latin America, and the second largest event in the Spanish-speaking world, attracting over 2 million visitors. This year gastronomy will be a feature of the event, as at so many book fairs and festivals in recent years. The ArteChef Publishing House, of the Federation of Culinary Associations of Cuba, will make nine works available to the participants in the 28 Havana International Book Fair to be held February 7-17. Eddy Fernandez, president of the aforementioned federation, announced that the books deal with various subjects, such as the style in kitchen, the history of emblematic sites such as the Mercado de Cuatro Caminos, in Havana, and cooking traditions in the province of Ciego de Ávila. The ArteChef publishing house is only four years old, but it has already published 40 books and has won eight awards in national competitions. and radio Coco says there is an interest in creating books that reflect the traditional and gourmet in regional cuisine, traditional native desserts, the typical Cuban dishes and the artistic challenges in the kitchen. 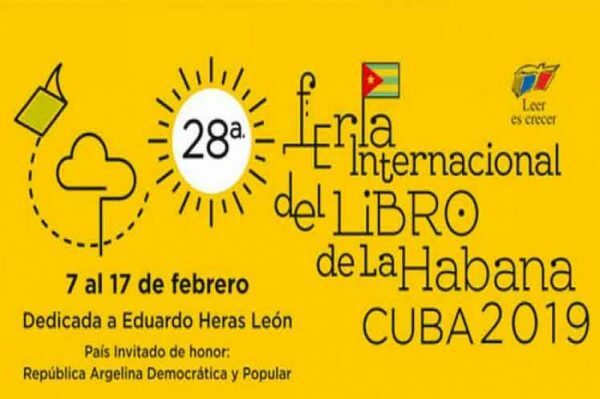 The Feria Internacional del Libro de la Habana has 43 confirmed countries attending, including Algeria (guest of honour), Argentina, Mexico, the United States and Chile. The 28th edition of the FIL will be dedicated to the 60th anniversary of the Cuban Revolution and the 500th anniversary of the founding of Havana.